Technovit® 3040 is a quickly hardening 2-component plastic with a methyl meth acrylate base (MMA). 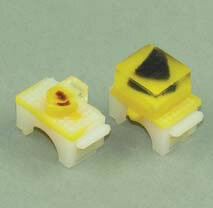 It is used to block or fasten embedded plastic specimens with the Histobloc® or for socket embedding. The Histobloc® supports are adjustable to Histoforms S + Q or for Histoform N.
Once Technovit® 7100, Technovit® 8100 or Technovit® 9100 has hardened, the Histobloc® support element is placed in the opening in the Teflon embedding form Histoform S/Q or Histoform N intended for this purpose (Image 1). 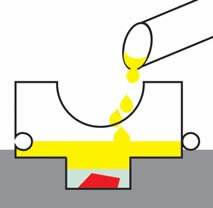 If Technovit® 8100 was used for embedding, the cover film must be removed from the specimen before the Histobloc® support element is put into place. For Histoform N, the aluminium lid is removed and the PE film is removed. Mix Technovit® 3040 until it is as viscous as possible (mixing ratio 2-3 volumetric parts of powder to 1 volumetric share of liquid). Pour the mixed material into the opening in the Histobloc® (Image 2). Technovit® hardens and the Histobloc® tightly bonds to the specimen in 5-10 minutes, depending on the room temperature. The specimen can now be removed from the form and is ready to be cut (Image 3). Through blocking with the very hard Technovit® 3040, the elastic Technovit® 7100 or Technovit® 8100 is stabilized in such a way that even the thinnest sections are possible. Clamp the specimen on the microtome. 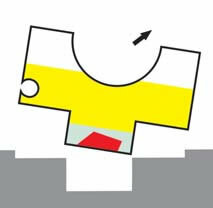 The square form of the Histobloc® allows for the specimen to be directly clamped in the rotation microtome's totem cam system. 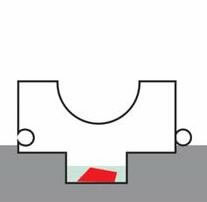 When using the round Histo embedding form for Technovit® 9100, the specimen can be clamped directly in the round specimen holder; blocking is not necessary. The Histoblocs can be stacked on top of each other for better archiving. Thus, serial numbering and space-saving storage is possible.